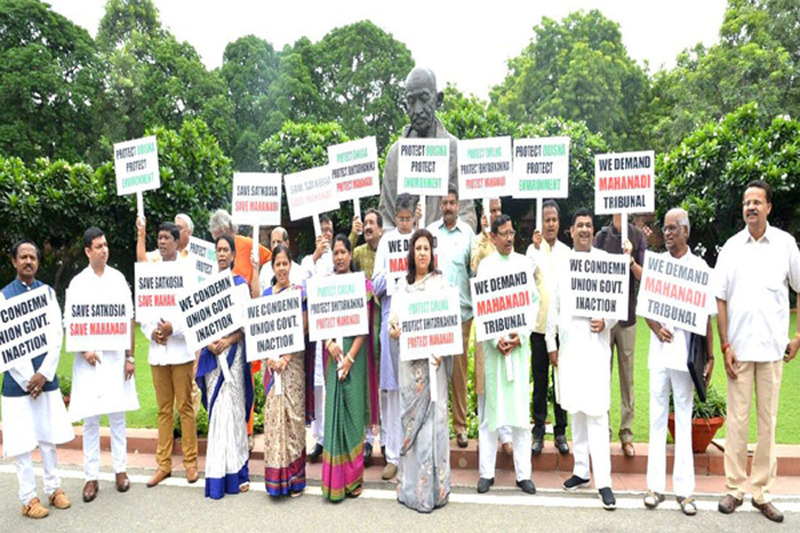 New Delhi: Demanding immediate stoppage of barrage works on river Mahanadi by Chhattisgarh government, Odisha MPs from both the houses in Parliament today staged dharna by holding placards and shouting slogans near Mahatma Gandhi statue. Twenty MPs from the Biju Janata Dal and Rajya Sabha MP Ranjib Biswal from the Congress featured in the protest near the Mahatma Gandhi. Politicians and MPs cutting across party lines are holding a five-day protest at Jantar Mantar in the national capital under the aegis of ‘Aagami Odisha’to put pressure on the NDA government at the Centre to form a tribunal to resolve the inter-state water dispute between Odisha and Chhattisgarh. Senior Congress leader Niranjan Patnaik and Rajya Sabha MP Ranjib Biswal, BJD MPs Tathagat Satpathy, Nagendra Pradhan, Kulamani Samal, Pratap Deb, Ladu Kishore Swain and Prabhas Singh along with ‘WaterMan’ of India Rajendra Singh sat on the dharna near Jantar Mantar in New Delhi on August 9 expressing their solidarity with the ‘Mahanadi Bachao’ Satyagraha. However, the absence of Union minsters Dharmendra Pradhan and Jual Oram at both the dharna sites has ruffled many a feather. A team of delegates is also scheduled to meet the President, Prime Minister and Union Water Resources Minister Uma Bharti during the Satyagraha to up the ante against the Raman Singh government in Chhatisgarh.